Charles Tim Buck is the Ring’s Fire Designer and Flight Technical Director—among the more job cool titles in the universe—and he has been the company’s master carpenter since 1990. 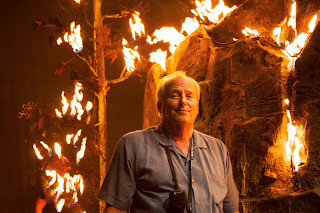 I talked with Tim (left, with the Valkyrie Rock burning in the background, photo by Rozarii Lynch) about how he enables the Rhine Daughters to sing midair, how he designs the fire, and what inspires him about live theater. You designed the harness worn by the Rhine Daughters in the opening scene of Das Rheingold. Is there an easy way to explain its unique features? People have been using harnesses for hundreds of years to carry somebody, to let them down, or for rescue or safety. These harnesses allow the performer to sing. That’s the difference. Most people who use a harness—rock climbers, for instance—they’re in that harness for maybe three minutes or until they can get to safety. Our harnesses have to be worn and used in the air for twenty-five minutes, and they have to move vertically and horizontally almost consistently. They also have stirrups and shoes so the singers can use foot pressure without having any weight around the middle of the body or through the legs, providing the diaphragm with the freedom to sing. And because the Rhine Daughters do somersaults, they’re hooked up on the sides, rather than a normal harness that goes right down the middle. Was it the Ring that made you come up with this design? Yes. For Seattle Opera’s 1985-1995 Ring, the track and the rotator and all the rigging of all the flying—they travel vertically and horizontally and also turning both directions—that was all designed for the flying horses. And then I just changed a little bit on the rotator to accommodate people instead of art scenery. What kind of background and training goes into your job? 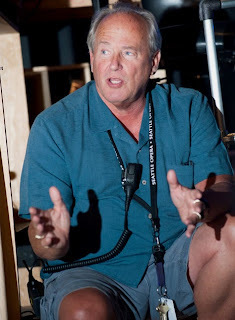 I have been working in technical theater since 1971. I have a BFA and a Master’s degree in theater. How many people does it take to get a singer airborne? For the flying there are three tiller operators and three rail operators. The tiller operators control the movement of the Rhine Daughters back and forth, and the turning, and the rail operators control the vertical, all their ascents and descents. Three of each. There is also a person who handles the way that the system works. It works as a counter balance, so there’s a bag of sand that takes the place of the singers when the singers aren’t there. There’s a guy that clips on the bags. I do all the hooking up and unhooking. And there are two additional people who put the harnesses on the singers and bring them to the stage. Your title is also Fire Designer. How did you get trained in that and what does that involve? 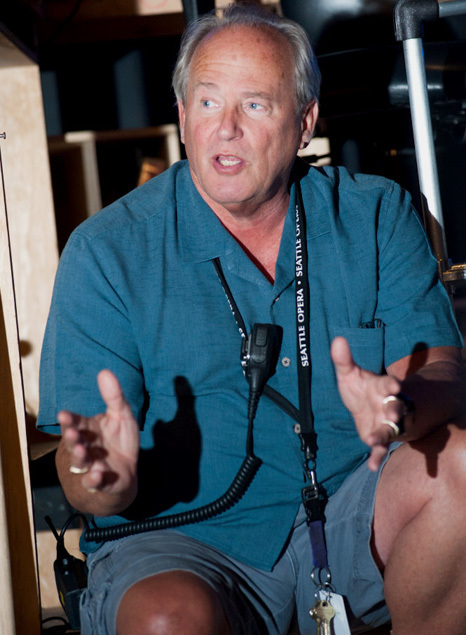 To get a Master’s in technical theater you take a lot of structural engineering, engineering, hydraulic and pneumatic systems training, all that kind of stuff. I also worked briefly in the military on explosives. For the company’s second Ring, we worked a lot with propane and we did a lot of research and development on how other gases work. For that one, the fire was in Götterdämmerung. In this Ring, the director wanted Wotan to start the fire and have it grow. Taking that artistic concept into mind, I started designing this system: there’s a 100 gallon propane tank and of that 100 gallons we fill it halfway so the liquid can convert to gas in the tank. We can then pump enough volume to control the 35 valves and almost 50 igniters. Each section of the ledge has a gas hose going off of the main distribution valve. So the valve opens and the igniter starts igniting for 4 seconds, until the fire is lit. Then the fire starts at one spot, that valve opens, and then that one and that one and that one. The four trees start from the bottom, then the fire leaps up to the next section. It was a lot of fun designing that. As far as I’m concerned and as far as my training is concerned, the whole thing begins with telling the story. That is what I’m trying to do and that’s what the effects are trying to do. I’m not trying to create splashy effects just to impress people. The effects are to help tell the story, to make the story everything that it can possibly be. So, the concept comes from the composer originally and then goes through the director to the scene designer and from them it came to me. Did the composer say there would be fire onstage? 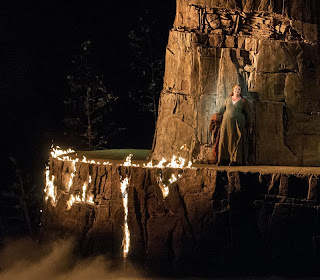 The composer said Wotan would surround Brünnhilde with fire to keep everybody away from her. With this particular Ring there wasn’t a heavy concept laid on it, like in the German Rings that are done in space or in a circle or like the Met in a big machine. This was a very natural, a very historic Ring as far as it follows what the composer had in mind. His whole vision of it being actually someplace in a forest or on a cliff or Gibichung hall or whatever. It’s all intended to help tell that story, the original concept. Are you backstage for every performance? In addition to being the designer I’m also the master carpenter. I’m the only person who has a pyrotechnics license, so, yes, I am in control of the fire every time it burns. I’m in control of the flame. How many people are backstage working on the fire? On the fire I have my pyro guy Ian who works under my license and controls the mechanical valves on the ledge; there’s a tank operator; and then there are people on fire watch on both sides of the stage who have been trained in putting out fires. Is there a fire marshal? You don’t think about that…it must get hot up there. Oh, yeah, it gets hot up there. In Ring 2, I was in the middle of it with Brünnhilde and the flames were above our heads all around us. We actually had a hot dog roast on that set. I think my two favorites are after the scene change from anything into the ridge terrain because the curtain comes down, there’s a rumble backstage with things moving out, and then the curtain goes up and it’s the forest. People often clap instantly. And the other one is when Wotan sets the ledge on fire. Are you an opera fan? My passion is theater. I love the telling of stories and the entertainment value in that and the value to people’s consciousness. People have more access to feelings and thoughts in this form of entertainment. And opera is the biggest theater, this is the big thing, this is 63 trucks full of scenery alone, not to mention how many people are working on it. There are 50 people working backstage, and roughly 100 musicians, 70 chorus, 20 principals, there’s a whole third floor of people selling it and promoting it and finances. This is the biggest theater job and mine is the heaviest responsibility job in the business. This is a heavier job than the Las Vegas shows. This is the major league if you were going to put it in baseball terms. That’s what’s thrilling about it and that’s what’s challenging about it. We have 10 days of load in, and then we go from that into tech rehearsal and orchestra rehearsal, so we’re working 9 am to midnight 6 days a week for the summer. There’s always somebody around saying “your cue is this, keep your eye on the ball.” It’s very taxing.